In Multidimensional Expression, Cousin function will write the same level member under the Ancestor specified in the second parameter. 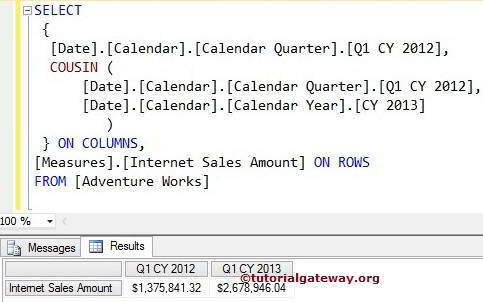 For example, If you know the value of first Quarter in Calender year 2014 and you want to find the sales of last Quarter in Calender year 2015 then you can use this MDX Cousin function. Member_Expression: Any Multidimensional Expression that returns valid Member. It will find the member Level. For instance, whether the member is first month of a Quarter, semester or Year etc. Ancestor_Member_Expression: Any Multidimensional Expression that returns valid Ancestor Member. 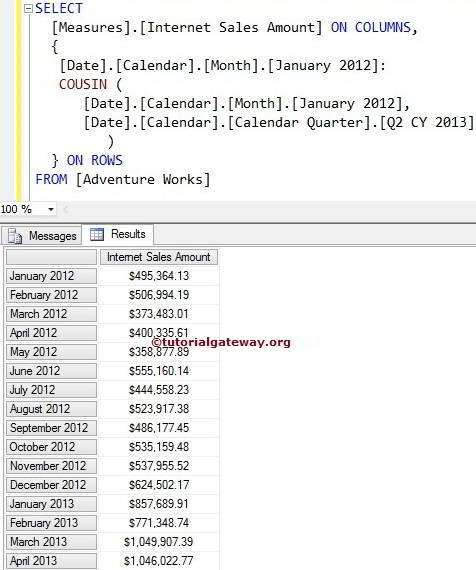 Cousin function will find the Cousin of First argument present in this Ancestor_Member. 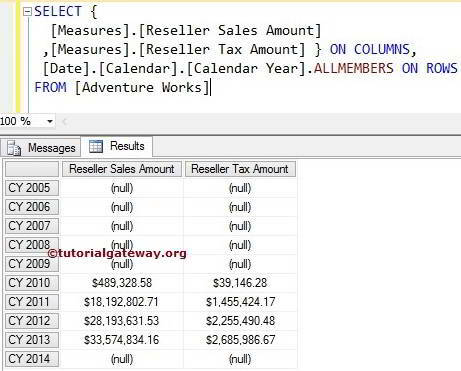 First line of code after the SELECT will check for Q1 CY 2012 and write the Internet sales amount of Q1 CY 2012. As we all know, Q1 CY 2012 is the First Quarter in Calender year 2012. 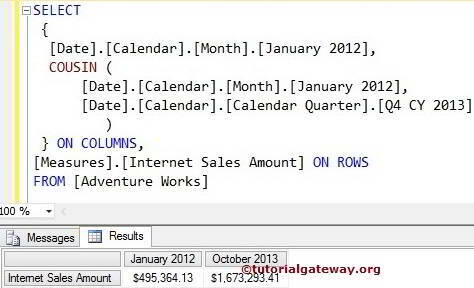 First line of code after the SELECT will check for January 2012 Month and write the Internet sales amount of January 2012. As we all know, January is the First Month of the Q1 CY 2012 in the Calender year 2012. In this example we are going to calculate the Range between one point to other using MDX Cousin Function. Now the range Operator (:) between the above statements will write all the Calender Month from January 2012 to April 2013.